When Carly called for photos of footprints for her Ellipsis Monday Photo Shoot #31: Footprints, I thought about past attempts to photograph such things, along a path next to the airplane Boneyard a few years ago and, unsurprisingly, at the dog park. These photos proved rather challenging to take and edit, because there is very little contrast or color variation to work with. I will add photos from these previous attempts to this entry if I can find them, but last night while my internet connection was down for hours I failed to turn them up. So let's start with Monday's new ones, taken - where else? 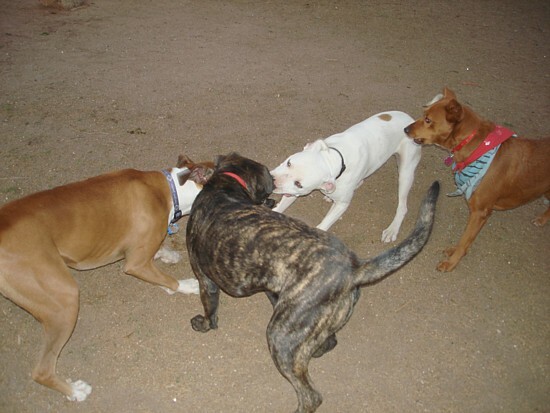 - at the dog park. 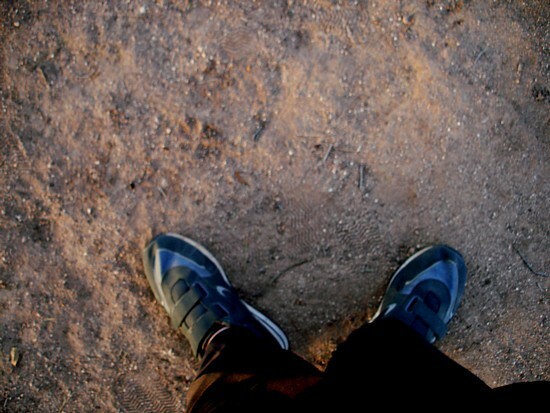 The dirt track at Miko's Corner is fairly sandy, so when the ground is dry the footprints of dogs and humans are fairly indistinct. But if you look carefully at the shot above you can make out at least a few pawprints. 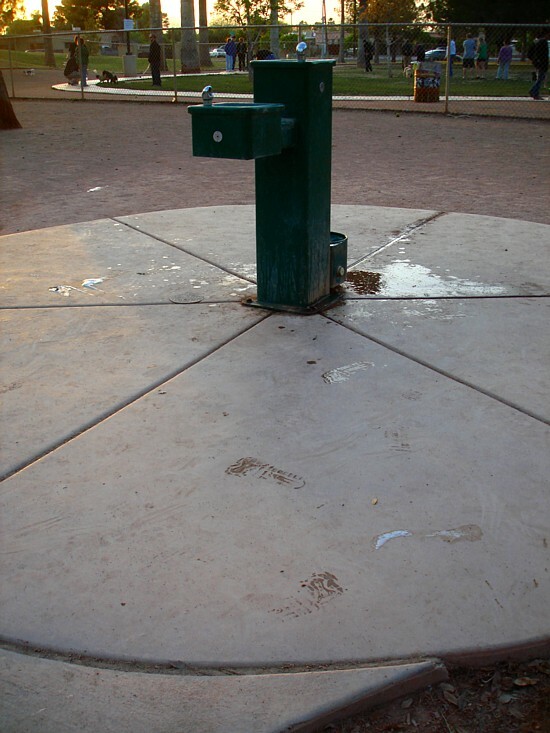 For this one I deliberately stood in the water splashed by dogs drinking (I think the fountain leaks a little as well). 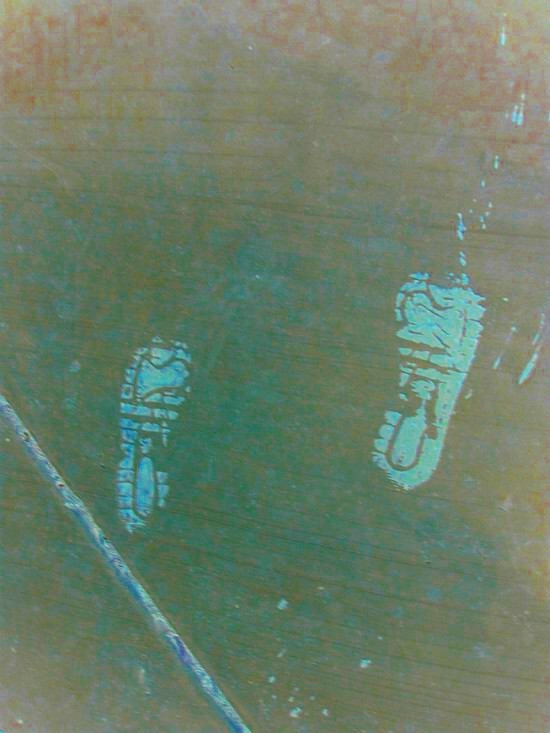 The resulting footprints from walking away soon dried into invisibility. This is an FX shot using negative, saturation and solarization. I wanted something more extreme, but brown and grey images don't lend themselves to wild effects in photo editing programs. 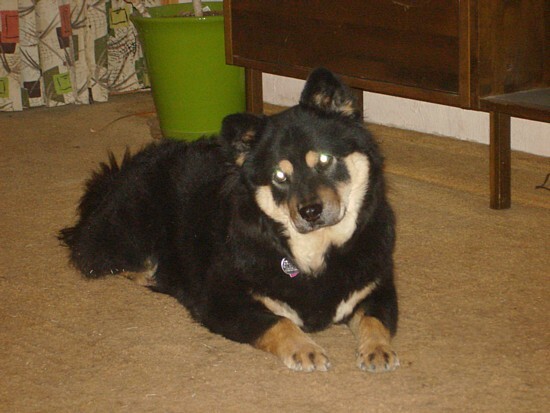 This rather atypical shot of Pepper is from April 2008. 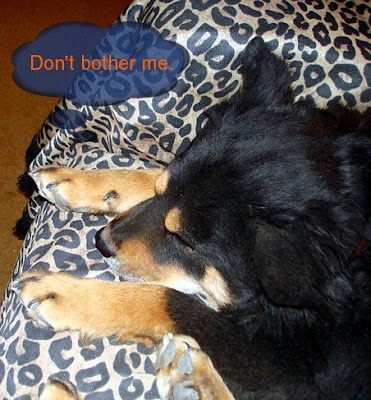 I may have posted it before, but this version is newly reedited to emphasize the pawprints. I suspect Pepper's extreme unfluffiness here was due to her being wet and muddy. An update to yesterday's entry: I'm giving GMail a spin. The address at gmail.com is Mavarin2. Feel free to help me try it out! For the last five days or so, I've been having trouble with AOL's webmail, the email client I use to avoid booting the AOL software. There are two versions of it, both of which load inside my Firefox browser, both of which are buggy. The new interface on the bells and whistles version now offers backgrounds, and I have mine set as a starfield, which is nice. You know what would be nicer? Being able to open my email! I mean it. There have been many emails lately that I click on, only to get one of several error messages. The email is "not found" or "can't be opened," or an unspecified error occurs that causes the whole client to reboot. Usually this happens with emails I actually need to open, as opposed to the automated junk. This is email from friends, or the next Auditing assignment, or the church bulletin for me to adapt announcements from to post to the church's news blog. There are also minor problems, such as not being able to place photos in the email in one version of the email client, and no ready means to insert or remove hyperlinks. There isn't even a button or menu item or key command for the latter. How backward is that? I have to create the formatted text elsewhere, and then paste it in. Sunday I had several important-looking emails, none of which I could open. 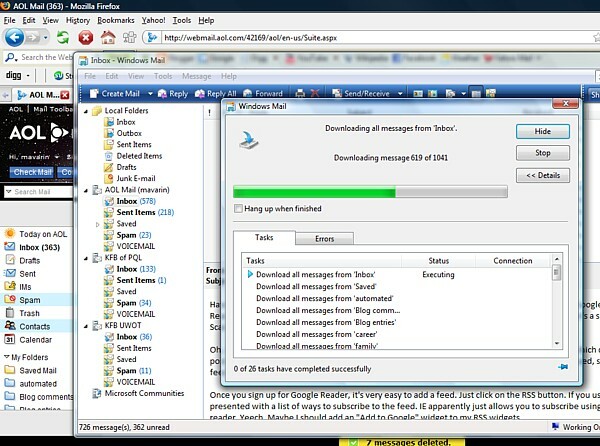 In desperation, I did something I hadn't done since sometime last year: I opened Windows Mail, the Vista equivalent of Outlook. After the obligatory error messages I get there too, the software set about catching up on many months' worth of email from AOL. It took about an hour, but at least I was able to read my mail at the end of it. Now, I've ranted this rant before, I'm sure. And I know there are alternatives. People seem to like Gmail, and after all I've already got significant ties with Google due to my blogs and webmaster tools and the fact that I prefer it for search. I also already have email on mavarin.com, which is hosted by Yahoo. But that one has other annoyances, mainly the huge daily influx of the most egregious forms of spam, some of which escape the spam filter. And I've had AOL as my email address since 1992 or early 1993, first with kfbofpql and later ignoring that in favor of the mavarin screen name. Despite my many issues with AOL, I find it difficult to sever this last link, especially as it means changing my email address with banks and bills and friends and other websites. But I think, maybe, I'm just about fed up enough to do it. The year was 1991. Or maybe 1990. One of our new fan clubs, the United Whovians of Tucson, had done a panel at TusCon, and afterward someone came up to me with a tractor feed printout of messages about Doctor Who. They were off a Usenet newsgroup. I got friends to explain about the Internet, but at the time it didn't seem all that easy for a non-techie to cope with. Months laters a Leaper (Quantum Leap fan) mentioned a "neat service" called Prodigy in a letter to me, sort of like CompuServe only cheaper. John got me the Prodigy software for Christmas. Somewhere in there, a Whovian named Tom ran a local bbs (online bulletin board service) for our club, where we could chat online with each other - but only if Tom had the server up and running at the time. But Prodigy was national, maybe international. It belonged to Sears, believe it or not. My new modem connected to it over the phone every night at a blistering 2400 baud, and showed short messages on a monochrome screen. There was no long term storage, and posts would drop off the service in 3 to 8 days or so, depending on how busy that particular message board was. The original software had no copy or paste functions and no uploading or downloading. Obviously there were no photos, just text. Eventually a third party app came along for my Mac SE that enabled me to finally save messages or paste in canned text, such as info on our other club, Project Quantum Leap, and my FAQ, Common Questions About Quantum Leap. Email cost 25 cents per message, and did not initially go beyond the confines of Prodigy itself. Oddly enough, I don't remember following Doctor Who on the P* boards. My main interests there were QL (which appeared just above the "RUSH" section of the TV-radio boards; it took me a while to learn that Rush was a person's first name, and about half an hour after that to learn that I opposed everything he stood for) and HG, or H2G2, or, to give it its full name, The Hitchhiker's Guide to the Galaxy. HG was the really fun area on Prodigy in those days. The service did not allow screen names, aliases or handles, but the HG "froods" merrily adopted handles in the texts of their postings, becoming characters, creatures and even objects from the Hitchhiker's book, radio show, tv series, LPs, audio tapes and printed bath towel. Sara G. was the Cricket Ball, Jim R. was the Voice of the Book, Sarah K. was Lord the Cat, Lesley H. was the Dolphins, and so on. We also had an Arthur and a Zaphod, of course. As for me, I bucked the trend and did my best to change my handle with every single posting, based on the concept that I, like the Universe in Douglas Adams' books, was bizarrely inexplicable. Or something. Going off-topic was against the rules, but such was the zany nature of the HG board that we sometimes made a point of being as off-topic as possible, in the funniest possible way. I also entrusted my Utterly Merry Comic Relief Christmas Book, already signed by one of the HG actors, to one of the froods so he could get Douglas Adams to sign it for me at a public appearance. I never got the book back, and I no longer remember who the irresponsible frood was who failed to return it. Twenty years ago, we were interviewing actors like John Levene in L.A. It was all a very long time ago. A year later, Prodigy raised its rates without improving its service much, and everyone started migrating to the new killer app, America Online. 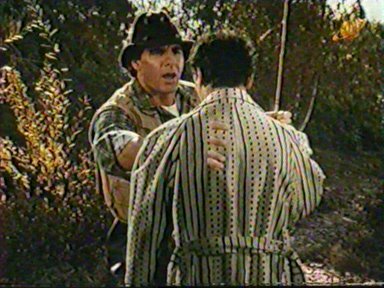 In my offline life, I was editing fanzines for both the Doctor Who and Quantum Leap clubs, and making a few trips to Los Angeles each year for conventions, interviews with actors and writers, and to buy scripts and photos. 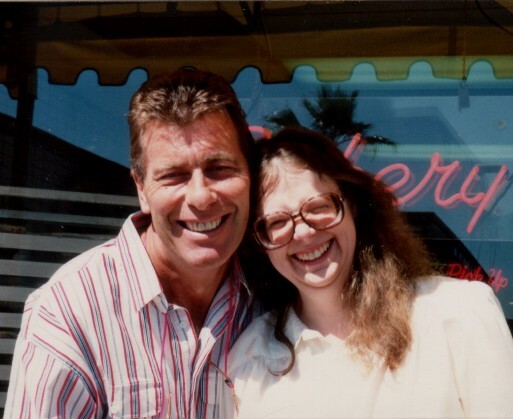 I met some of the online people, including Julie B., at an early Quantum Leap screening for fans, and subsequently at three conventions held in metro L.A. But Quantum Leap was canceled in 1993. 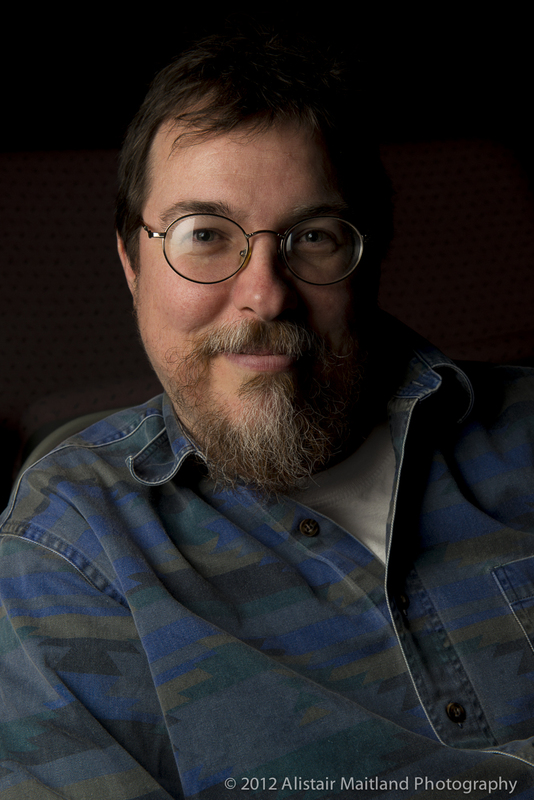 I eventually passed on the editing of The Observer to Sharon Major, and of TARDIS Time Lore to several successors before the Doctor Who club folded in 2000, five years before the show returned to television. It's been months since I've watched a Quantum Leap episode, although I have the complete run on both DVD and videotape. A Doctor Who DVD, on the other hand, is currently on pause in the next room. The first actor I ever interviewed that played the Doctor, Jon Pertwee, has been dead for a while now. I probably haven't seen Julie B. in person in over a decade, although we're in frequent touch online. And of course, the landscape of the Internet itself is utterly different now, except in some of its essential purposes: communication, to the world and peer to peer. The reason I'm waxing all nostalgic and wistful tonight about the days of Prodigy and those early cons is that two things happened today that brought home how long ago it was, this wonderful, technologically backward, utterly irreproducible era of my life. First, I got a friend request today on Facebook from Lesley H. It took me about 30 seconds to place the name. Seventeen years ago, she was a teenager on the HG boards, better known as the Dolphins. Plural. Now she's a lawyer. She was as weirded out about me calling her Dolphins as I was that she's a lawyer. I turned on the tv and saw this scene. Second, I got email tonight from Julie, conveying greetings from an actor I interviewed repeatedly for The Observer. Richard Herd is one of those working actors that you see everywhere but may not know by name. He was Captain Galaxy and Ziggy the Miner on Quantum Leap, George's boss on Seinfeld, an Admiral and a Klingon on various series of Star Trek, and so on. I like him a lot. Richard and I exchanged greetings tonight through the kind auspices of Julie, who is at the first Quantum Leap convention in a decade or so. It's the 20th anniversary convention, in fact. Twenty years ago this weekend, the show premiered on NBC, and took over a good chunk of my life for several years. I didn't even remember about the anniversary, or that the convention was this weekend, until Julie emailed me tonight. Now I wish desperately I was there, seeing those fans and friends again, the actors, writers and directors I interviewed nearly 20 years ago, and the wonderful land of Hollywood where the con is taking place. But I can't. Just can't. Having been unemployed all this time, I'd be selfish and mad to spend money on that now. 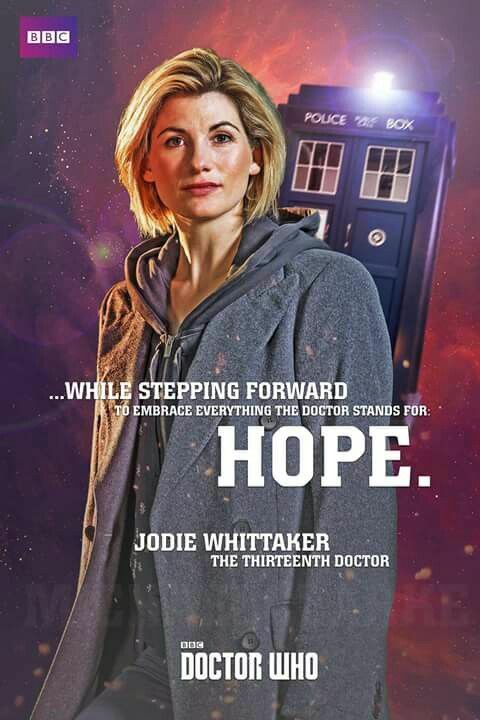 But I want it, at least as badly as I wanted to go to Gallifrey One last month and meet one of the producers of the revived version of Doctor Who. Ah, well. At least I have a color screen to type this on, and copy and paste, and this posting won't age off some not-quite-internet sometime next week. And an email to Julie won't cost me 25 cents. I guess it will have to do. Last time I checked, Pepper only had one vote on my cute dog photo poll, which says to me that either everyone really likes Cayenne better or I just haven't taken a good enough photo of Pepper yet. Here are two more attempts, before we get to the other topic of the morning. I still haven't really captured her at her best, but I'll keep trying. I should be able to come up with a clever metaphorical subtext for the next couple of photos, something about rivalry between the dogs or being pulled in different directions in how I spend my days. But let's skip all that, and just look at the pictures! 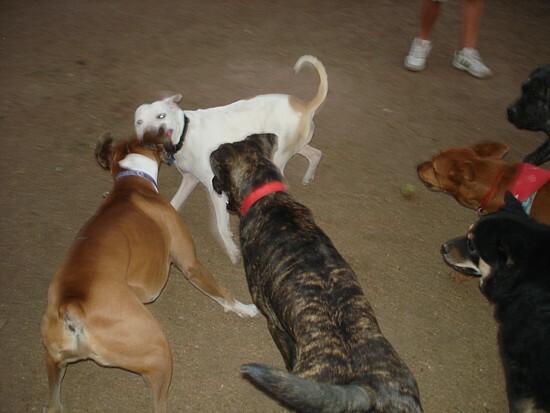 After several recent unpleasant incidents, a grand time was had by all at the dog park on Friday evening. 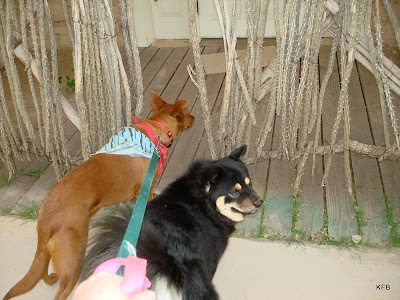 The "regulars" chatted and watched their dogs romp, without a single skirmish. 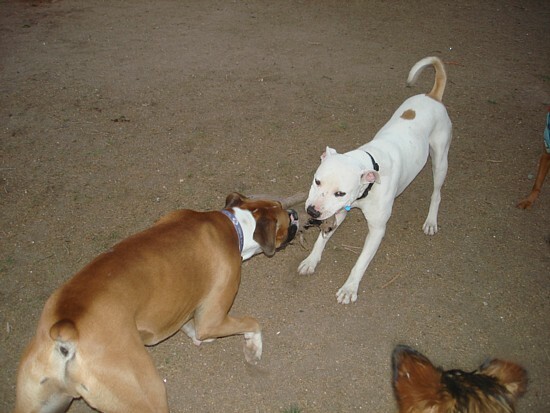 The highlight came when this boxer and this white dog got into a tug of war with the half-destroyed inner core of a soccer ball. They were obviously enjoying the game, and all the humans stood and watched, even joking about placing bets on the winner. I was rooting for the bulldog, but the white dog won every time! A couple of times, this brindle mastiff puppy managed to get hold of the prize as well, so that it was a three-way tug. Cayenne, Pepper and other dogs surrounded the contestants, barking. It's funny how different people observe the same canine behaviors and draw different conclusions. 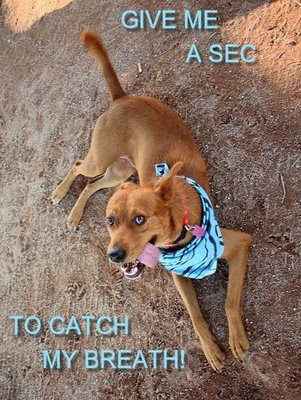 One of my friend at the dog park, Steph, calls Cayenne a "regulator" because of the way she hovers near play-fights and barks. 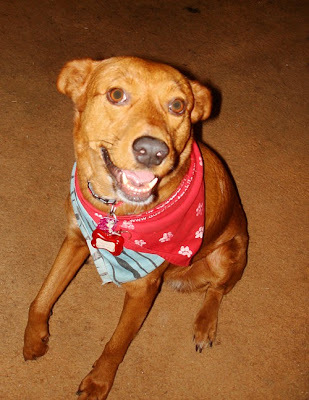 Her theory is that Cayenne is playing cop, telling the other dogs to behave. I think she's merely excited by what's going on and wants to be part of it. Weekend Assignment #260: Maybe it wasn't the "best" job by objective standards, but of all the jobs you've ever had, which was your favorite, and why did you like it so much? Extra Credit: What was the shortest time you ever held a job? What happened? prepared to leave the company. 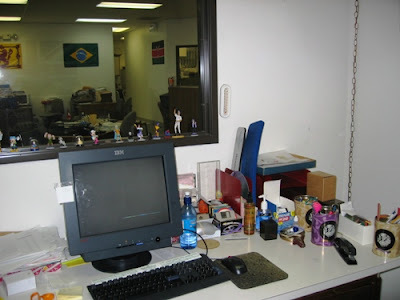 My favorite job to date was at Worldwide Travel, where I was Operations Manager, Comptroller, and staff accountant. I did pretty much everything bookkeeping or accounting-related except the income taxes. I also designed a company website and maintained it for a year or so. It wasn't the most lucrative job I've ever had, and I didn't always get along with every employee that came to work there. And I have to admit that toward the end of my twelve years there I was a bit bored, and less motivated than I had been to give the job all my attention and effort. But it was an important job for my for several reasons. First, it gave me a chance to learn a lot of basic accounting, a process that had started less than two years earlier at Travel Tree/Travel Network. Second, it gave me a decent wage compared to every job I'd had to that point, with raises along the way. Third, and I can't stress this enough, this was the first job where I felt like a "treasured employee," as my boss called me occasionally. When I had worked in retail, and later as a travel agent, I had mostly worked for men who managed by intimidation and browbeating, who looked for deficiencies and overlooked successes. Mal and Sandy Potter, who owned Worldwide Travel, weren't like that at all. They made me and other employees feel appreciated. Early on we used to get a birthday check and other little perks, and even when those went away there was at least a birthday cake, and a supportive attitude. The business suffered many setbacks, including the cutting of airline commissions from 10% to 5% to eventually zero, the rise of online travel sites, the blow to the travel industry dealt by 9-11, and Sandy's declining health. But Mal and Sandy never tried to blame or pressure their staff to make up for such calamities. Instead Mal instituted sevice fees and negotiated deals with tour companies, and managed to keep the company going for years while other travel agencies folded. "It is what it is" was Mal's motto, and he used that philosophy to make the best of circumstances rather than complain too much about things not going his way. And I admire him for it. As for the shortest job I ever held, my four days working in check cashing stores this past January are beaten handily by a job I quit after a single day. It involved going door to door in towns and cities around Ohio, canvassing for some kind of supposedly progressive tax reform proposal. We were given some minimal indoctrination and training, and driven to Marysville, where I accompanied someone who had been doing the job for a while. I had previously gone door to door as a Girl Scout (selling cookies), on behalf of a group fighting Multiple Sclorosis (also for just a day or two, as a volunteer) and as an enumerator for R.L Polk (compiling a City Directory), and all of those experiences had been fairly excruciating for me due to shyness. This one was worse. Beyond the social discomfort, I was deeply uncomfortable about the fact that I wasn't well-versed on the issues involved, and wasn't at all sure that if I did the research I would still agree with what I was being paid to espouse. So when they came to pick me up for a second day of work, I told them goodbye. I had a couple of awesome mentors when I was in high school and interested in science. I participated in the American Heart Association's internship program, and was sent at first to a laboratory in which the researcher was working on elevated lipoprotein levels in various cell lines. She was really friendly and welcoming to me, and spent a lot of time explaining the process of sending articles to journals and requesting grants and a lot of the more fund-raising side of science. I'm not sure I can answer this one. Sigh. My fifth grade teacher was pretty good to me. He was the track and soccer coach, and I did well in both of those. He helped me a bit in track, but nothing much more than most students. Did I ever tell you I set him up with my sister? That might be a story for another time. There are benefits to having a sister ten years older. That's it for now! I look forward to hearing about your good and bad jobs, past and present - and no, I don't expect you to name names unless you want to. And I'm running low on "guest professor" suggestions for these Weekend Assignments. Please, please, please email me some new ones. Thanks! 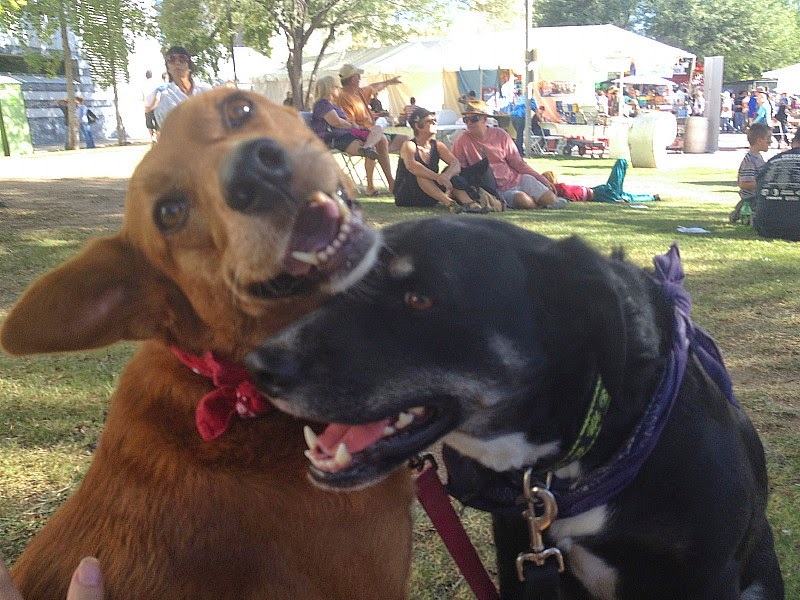 Pick The Cutest Photo of the Blocher Dogs! "You realize that you're posting about nothing but the dogs these days," John said the other night. To some extent, this is almost inevitable. What do I do all day since being unemployed, and who do I see? What are the stimuli that feed my brain? I'm not going to go on too much about messing around online (too commonplace), or the daily lack of a job nibble (too depressing, and nothing to report). I could tell you about the two blocks of Auditing review assignments that had no questions to answer, so the computer grading system can't cope due to a lack of metrics to measure. There. I told you. Do you care? Of course not. Even I don't really care. I'm rereading Harry Potter, but there's little to be said about that. John wants me to get the New Yorker towed away, but I'll report on that when it happens. There's politics, but I find writing about that rather stressful. Let me refer you to Rachel Maddow and leave it at that. Religion is also tricky for me to write about, although I do it anyway from time to time. But church life is occasionally worth a paragraph or two. A parishioner mentioned in the church office today that nitrites, that carcinogenic ingredient in such processed meats as hot dogs and bacon, has been found to help regulate blood pressure. So that's mild good news for John Scalzi and other bacon lovers, but not something I care enough to hang a blog entry on. "Make no mistake; hot dogs are still bad for you," the parishioner added. And John bought a ton of hot dogs as Costco yesterday. C'est la vie. So what's left to talk about? Well, I'm afraid we're back to dogs. 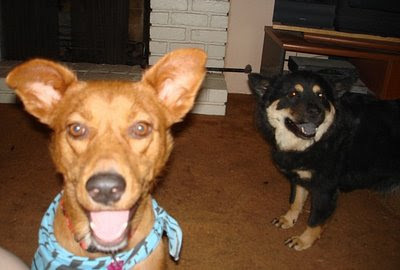 If you're still reading this dog-heavy blog, I'm assuming you're not utterly sick of seeing pictures of Cayenne and Pepper - yet. In which case, I'd like your help with a little project. Now, this may look okay on a desktop computer monitor, but on my laptop Cayenne is washed out and a little out of focus. So let's see if we can top this picture. 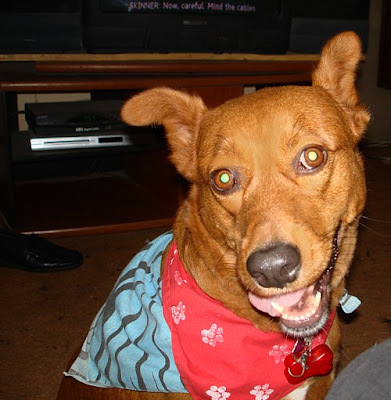 I'm going to post five of my favorite photos of Cayenne or Pepper. 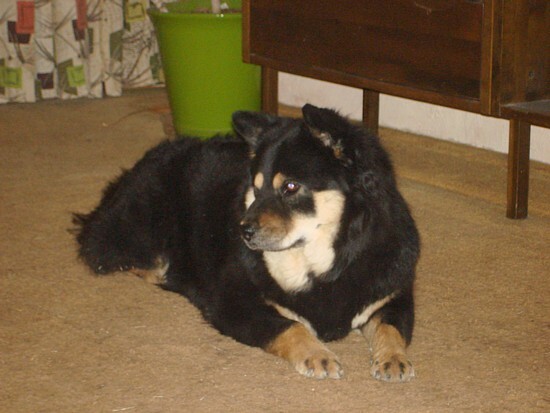 (I also have faves with both dogs in them, but that might muddy the waters in a contest like this.) Your task is to vote for your favorite. Ready? Which is the cutest of the photos shown? Yesterday, as part of my response to Carly's Ellipsis Monday Photo Shoot #30: Things That Float, I told you about Desperado Duck, a promotional rubber duck for the Wigwam Resort that I got at Worldwide Travel years ago. 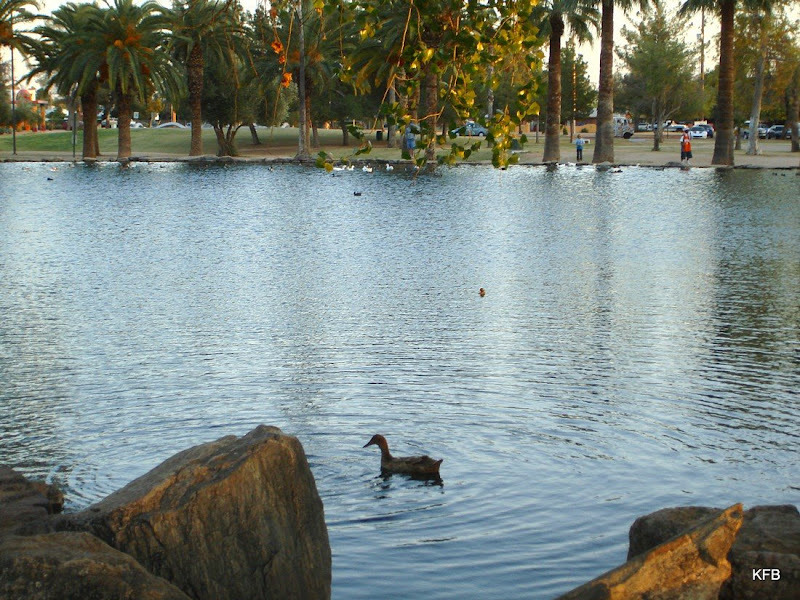 When I took Cayenne and Pepper out to Reid Park on Monday, I brought Desperado along, hoping to photograph him floating along with other ducks. Little duck in a big pond. We didn't have much luck setting up a good shot in the northern pond or the feeder stream, so I decided to try the southern pond. 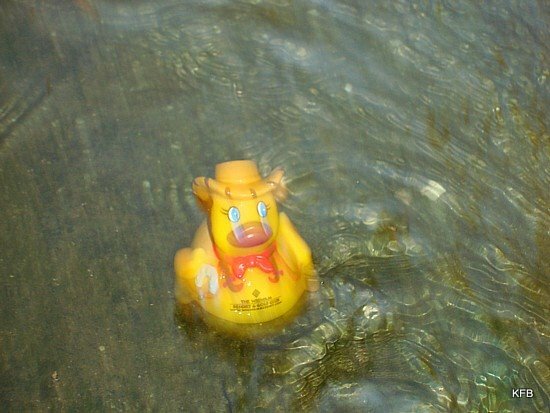 I knew there was a good chance that Desperado Duck would escape into open water and be irretrievable, but I decided to chance it. I set him down carefully next to some rocks, and hoped he would stay put until some big ducks floated nearby. 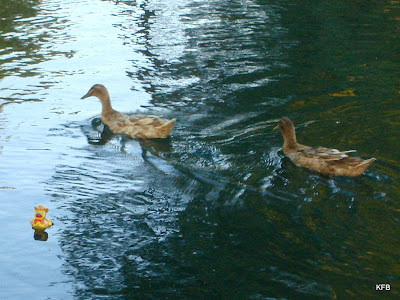 Desperado Duck swims toward the other ducks. Success! Sort of. DD wasn't all that close to the pair of ducks that were floating by, but he was at least in the same shot. That when Desperado made a break for it, quickly floating out of reach! Desperado Duck finally poses for my shot, at the cost of his freedom. It was totally worth it, I thought, to lose Desperado to the open water in exchange for this blog entry. But I still hoped to get him back somehow. I went to the other side of the pond, but by then Desperado was a tiny yellow spot in the middle of the urban lake, with no sign that he had any intention of coming in to shore. I gave up for the moment and took the dogs to the dog park. 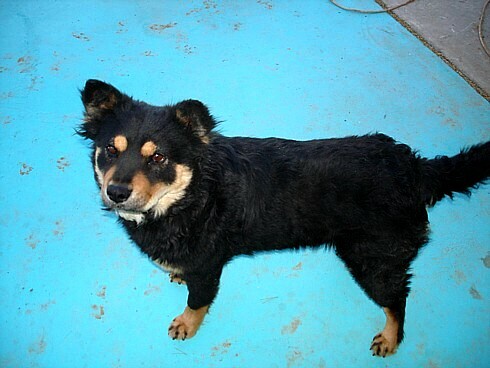 Pepper had been whining impatiently, and I could not deny them any longer. 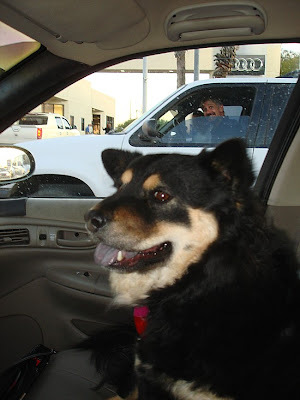 After the dog park, I left the dogs in the car (it was dusk, and no more than 70 degrees) and headed back to the pond, in case Desperado had tried to reach shore. 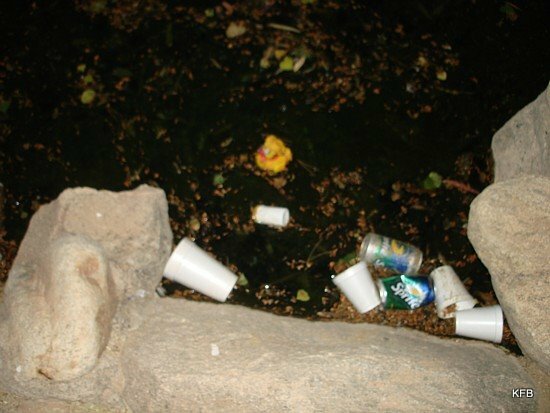 At the south edge of the south pond I found lots of floating trash and leaves and muck. I had high hopes for something yellow I spotted at the very edge, but it was a bread wrapper or something like that. But wait...what's that over there? Floating with the flotsam and jetsam. Yes! 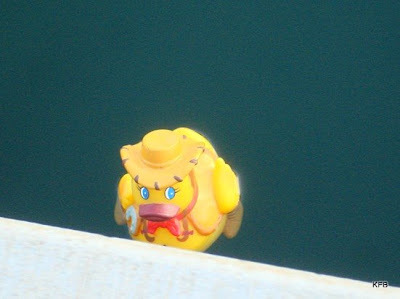 It's Desperado Duck! I reached down, and he let me take him safely home. 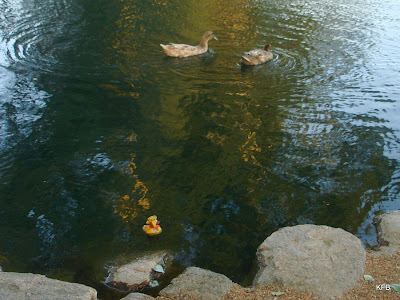 For Ellipsis Monday Photo Shoot #30: Things That Float, I thought immediately of ducks - not just the ones in the duck ponds at Reid Park, but the rubber ducks I have at home. 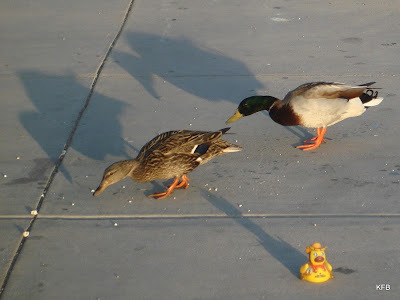 One of them didn't turn up in a quick search, but Desperado Duck, a promotional rubber duck dressed as a caballero, was right where he always is, hanging out near my Madeleine L'Engle books. 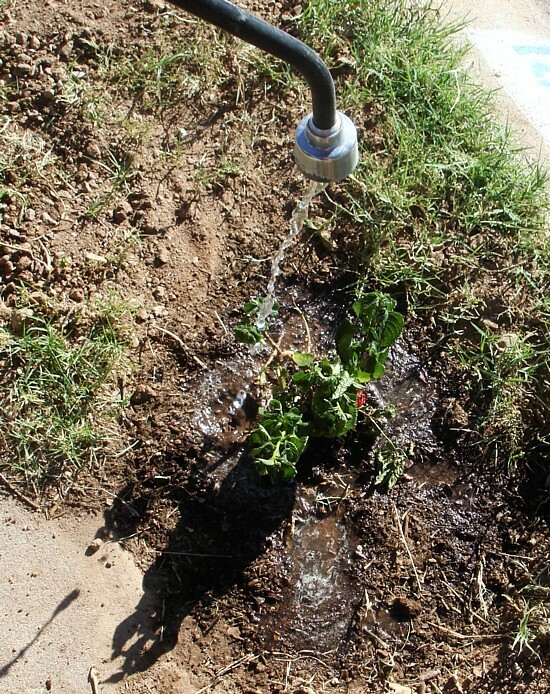 I took him, along with Cayenne and Pepper, out to Reid Park, to see what trouble we could get into. 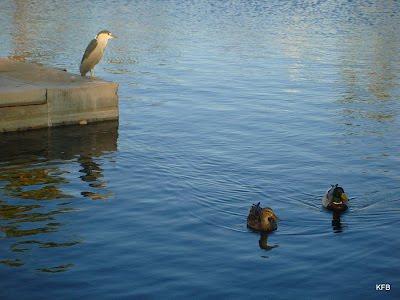 When we got to the northern duck pond, other ducks were already demonstrating the fine art of floating, overseen by a black-crowned night heron. As we know, ducks float because they're made of wood. I decided to let Desperado Duck try his luck in the feeder stream between the two ponds. On the first try, he got stuck at the bottom of a tiny waterfall, rolling over and over. 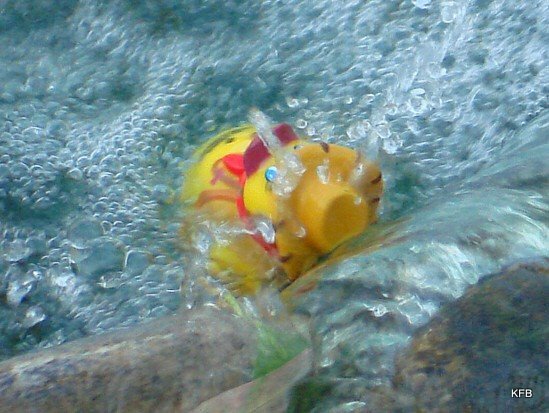 Desperado Duck shoots the rapids -and gets stuck in the waterfall. On the second try, I might have gotten Desperado close to a pair of the local ducks had not Pepper chosen that moment to lunge into the water herself. 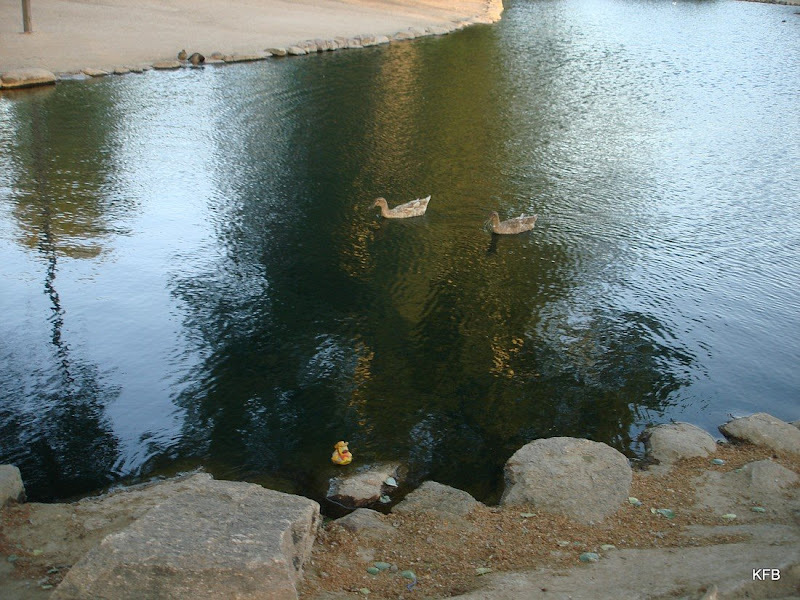 The ducks flew away, and Desperado floated rapidly toward the mini-waterfall. Desperado Duck floats rapidly downstream, and soon falls over. After this doubtful result, I gathered up Desperado and took a few more pictures of the beautiful and rather unusual heron. The heron shows little interest in floating. Or ducks. Then we made out way to where a father and his little boy were feeding the ducks, much to Cayenne's interest. She used Pepper as a step stool to get a better look. 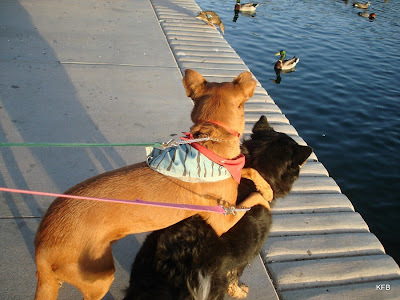 But Cayenne is desperately interested in ducks. Desperado tried to hang out with the other ducks on land, but I could tell his heart wasn't in it. Just one of the ducks. Not a very hungry one, though. 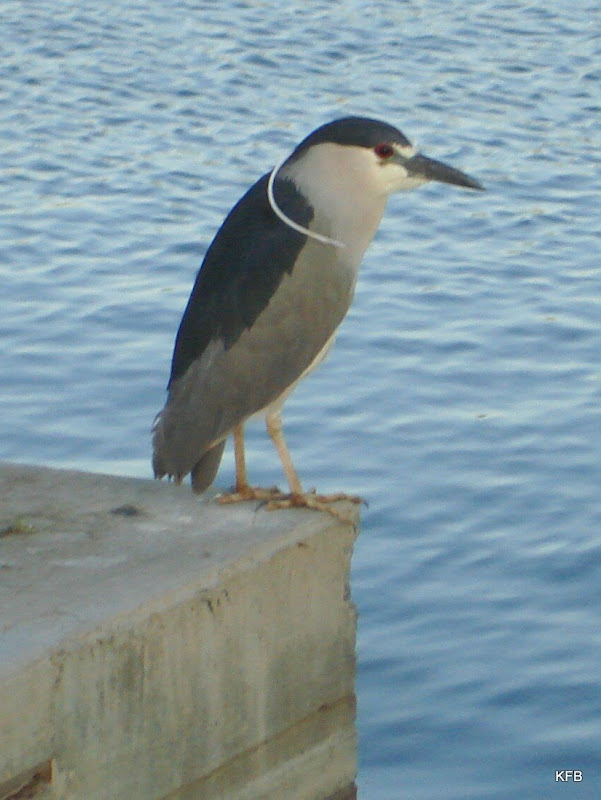 Even when I risked putting him in the water near where the heron had been, he stayed next to the dock. But it was all a ruse. Desperado Duck had a greater adventure in mind. Tomorrow: Part Two - The Getaway! "He just sits there, making random remarks"
- Lawrence Nightingale, Doctor Who episode "Blink"
Casa Blocher as spring 2009 begins. Sunday was John's birthday. It was low key but pleasant. I got him a couple of books that he seemed to like, one on Disneyland design work and one on remodeling bathrooms. 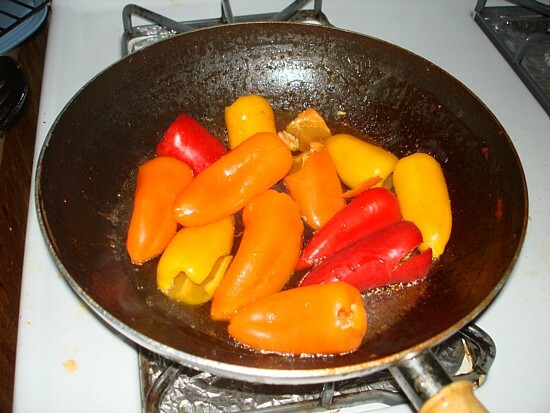 Small, colorful peppers to be served with mild Italian sausage. John waters a recently-planted flower bush that's shriveling in the sun. The day started with me oversleeping due to haven;t set the alarm wrong. John woke me up five minutes before church started. I managed to get dressed, pick up Kevin and get to church just before the gospel reading, which is early on in the service. I was able to suit up and serve at the second half of mass, basically sneaking in during the Sign of Peace. Proscovia was decidedly short-handed, so even a late additon was better than doing without me entirely. 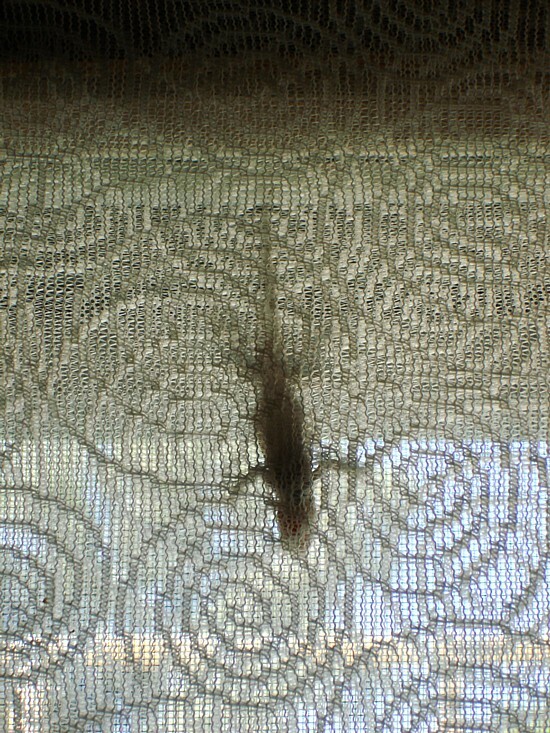 A lizard hangs out on our curtains. Monday morning I further researched the extension of unemployment benefits, since I'm about two weeks away from needing them. It turns out you have to apply online for them. The directions said it was on the same basic online form as an initial application, so that's what I filled out. The system knew about my previous last date of employment, but there was no clear indication what I was applying for. The directions specifically say you can't call right away and ask questions about the application. I hope I did it right! Also, the online form insisted that it was only compatible with Netscape 4.7 and up or some version of Internet Explorer or higher. Even when I opened it in a newly-upgraded IE, with the state unemployment pages added to the trusted sites list, the form insisted it was not compatible. But it was. 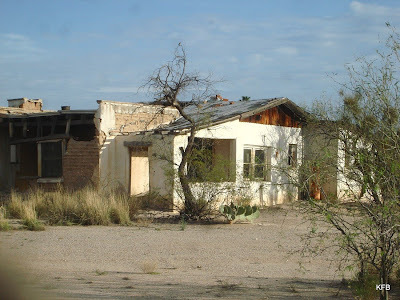 This morning I mentioned that I have taken lots of photos over the years of old buildings in Tucson. Tonight I thought I'd show you a selection of them, shots that, as far as I can tell without searching every blog entry, I haven't posted before. Tucson, right near the Diamondback bridge. 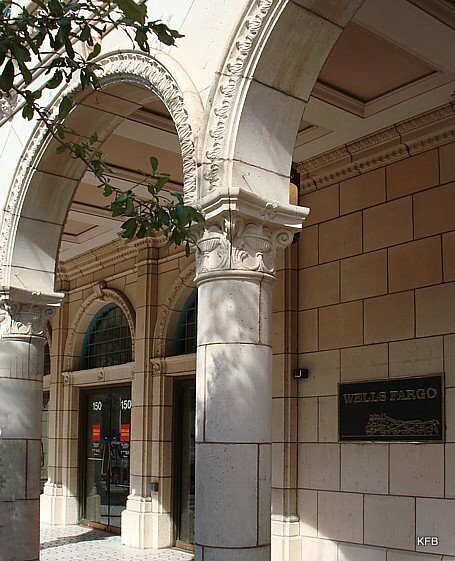 Wells Fargo Bank entrance downtown. Historic Hotel Congress, where Dillinger stayed. A rather nice derelict building downtown. I'm not so well organized in my photo files that I managed to find everything I wanted to show you. But you get the idea. 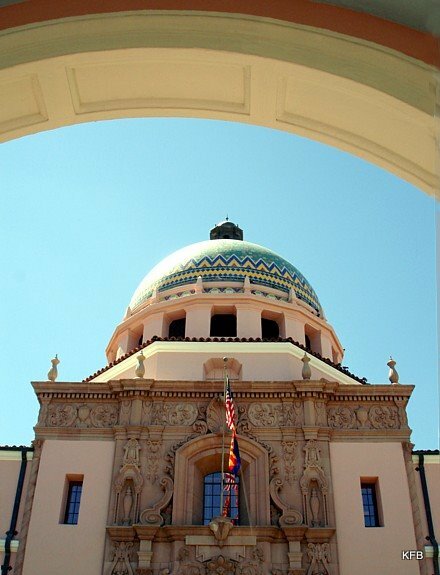 It's also possible that I've posted one or two of these before, but I did search the entries tagged "Tucson" before posting there. 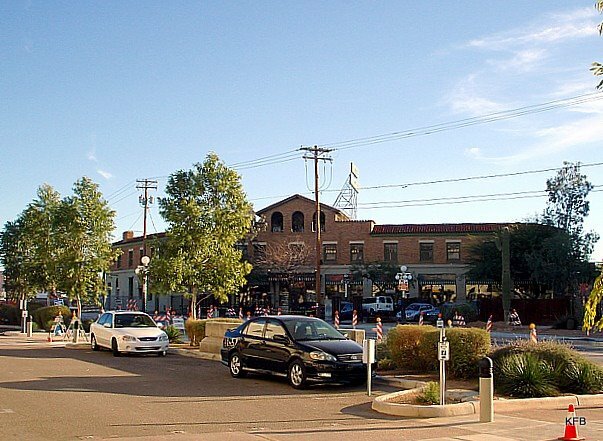 Two weeks ago when I posted the topic "The Old Place" for today's Round Robin Photo Challenge, I had a vague idea of going to Old Tucson for my photos, or maybe downtown. 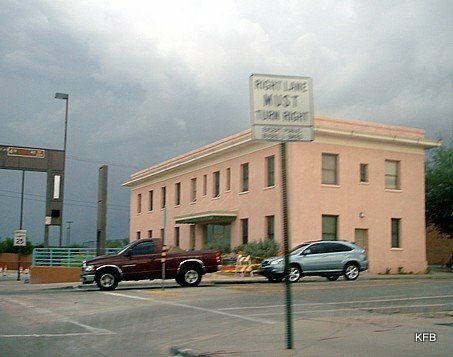 Over the years I've taken many hundreds of photos of historic places around Tucson - old office buildings, the courthouse, a movie location built in 1930s, midcentury modern buildings, old hotels and motels, even my own church. I could fill this entry up many times over with file photos, but I'd rather post something new! This week when Friday afternoon arrived, I hadn't taken any new pictures for it yet; so I selected a closer, probably more appropriate locale: Fort Lowell. Please excuse my delay in posting - aside from one tv show and four hours of sleep, I have been alternating between this and my CPA review course auditing assignment for the past 19 hours. 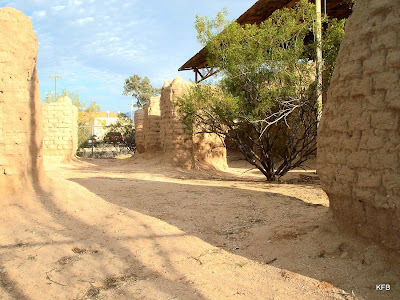 Fort Lowell was established in 1873, near what is now the corner of Craycroft Road and Fort Lowell Road in Tucson, Arizona. At the time it would have been at the edge of town, or more likely beyond it. 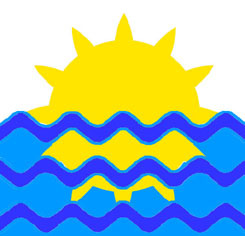 The fort soon became a supply depot, garrison and trading center. 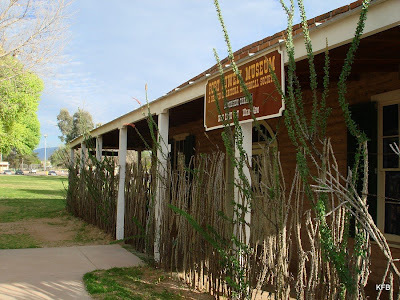 From here troops were dispatched to protect settlers, wagon trains and supply wagons, and to fight the Apaches. After Geronimo's defeat, the need for the fort declined. Despite local protests, the army shut it down in 1891. 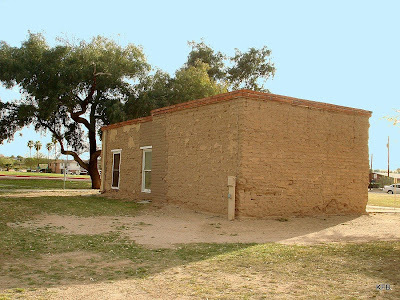 The main site is now Fort Lowell Park, located on the east side of Craycroft near the end of Ft. Lowell Rd. 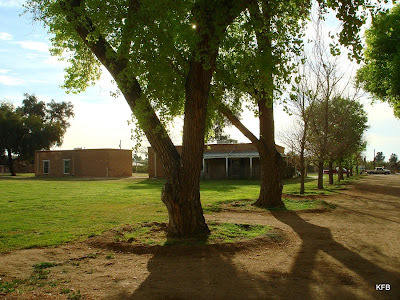 The photo above is of historic Cottonwood Lane, the tree-lined dirt road that nowadays leads from the modern parking lot past the Fort Lowell Museum. 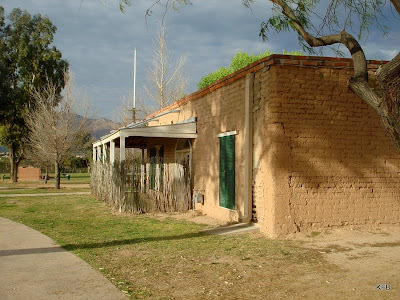 The buildings were made of Sonoran-style adobe brick. This was a common, relatively quick and easy building material around here - still is, really. 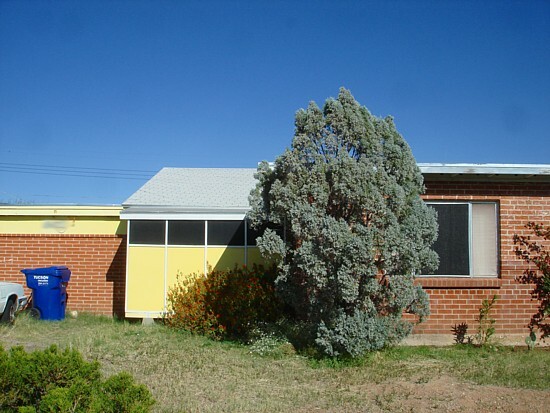 A disadvantage is that over the decades it crumbles away unless maintained and repaired. 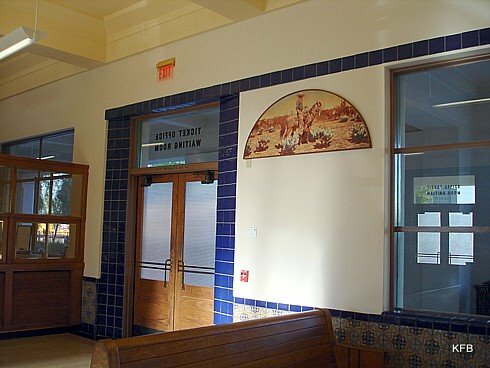 The museum is housed in the reconstructed Commanding Officer's quarters. Two sides of this have overhangs for shade, edged with ocotillo ribs. Ocotillos are a spiky, tall flowering shrub that dries into sticks, only to grow new leaves and flowers during the monsoon. If you look closely, you can see that at least some of the ocotillos in the museum's two fences are living plants. The dogs were very interested in the closed museum entrance. Cayenne in particular wanted in! The post hospital is in an advanced stage of decomposition. This is what happens to adobe during a century of neglect. The hospital ruin is fenced off, with a roof over part of it to protect it from the desert sun. Carved letters can be seen on an inner wall of the remaining structure. I'm not sure whether that is old or recent graffiti. It could easily be both. At least it's not spray paint! The historic site extends beyond the park onto Fort Lowell Road, where ruins and near-ruins co-exist with private homes. 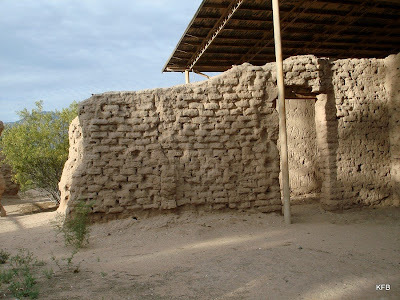 Here is an old house on which you can see the more modern facade added to the caved-in adobe. 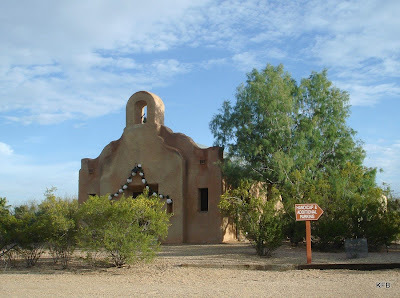 San Pedro Chapel is also part of this historic neighborhood. 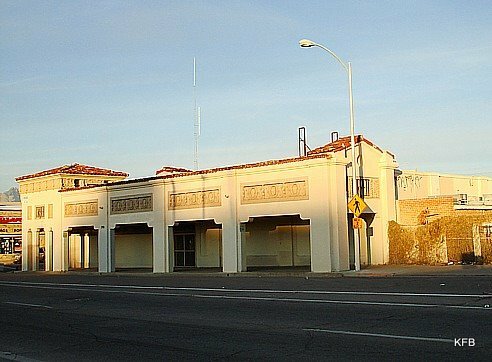 I don't know anything about it other than that it has an historic marker, an adobe crypt and a sign about a concert. As usual, I took many more photos than I can show here, so I've set up an online album for the best ones on Picasa. Click on any photo to get to it, and see larger versions of these and other photos. Now let's tour the other Robins' old places! Rita ***Welcome new member! *** - Posted! Leslie **Welcome New Member** - Posted! And be sure to check the Round Robin blog for a heads up on the next topic! 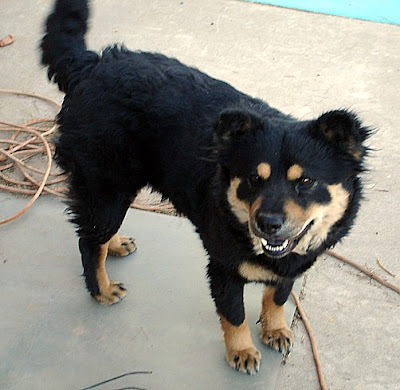 F&FFF: Who's a Pretty Dog Then?